FinTech Studios is a next generation NYC-based business accelerator that invests in great FinTech entrepreneurs, innovative products and disruptive business models targeting the world’s largest industry, the $4 trillion financial services market. Our founders and advisors have more than 150 years of combined experience in starting, building and investing in great FinTech companies on Wall Street and have closed billions of dollars of transactions and created billions of dollars of market value for investors and shareholders. What We Do We make SEED investments in great FinTech startups. We help FinTech startups BUILD and SELL innovative, disruptive FinTech products. We provide strategic SALES, MARKETING and BUSINESS DEVELOPMENT services to our portfolio companies to help accelerate sales at leading financial institutions. We provide ACCESS to a high value global network of FinTech mentors, advisors, channel partners, financial institutions, entrepreneurs, strategic investors, venture capital firms and angel investors. Why Are We Different? We are DIFFERENT than every other accelerator in the world. Our founders and advisors are experienced FinTech entrepreneurs and investors with substantial hands-on experience in starting, building and investing in successful FinTech businesses. Our team has DEEP industry relationships with top C-Level decision makers in major financial institutions and our team actively sells and markets the FinTech products developed by our portfolio companies. Our founders and advisors have more than 150 years of combined experience in starting, building and investing in great FinTech companies on Wall Street and have closed billions of dollars of transactions and created billions of dollars of market value for investors and shareholders. We are focused ONLY on the FinTech marketplace and our business model is a HYBRID accelerator/operating company model that allows us to invest seed capital combined with significant sales, marketing and business development resources to help our portfolio companies achieve their first $1-5 million in sales. Our UNIQUE APPROACH results in less outside capital required by the business (because sales are increasing), better pre-money valuations for startup entrepreneurs and lower risks for investors. FinTech Studios programs run for a longer period of time (12 months vs 3 months) than other accelerator programs, because 150 years of Wall Street experience tells us it typically takes at least 6-12 months to confirm MVP product/market fit and close key initial enterprise deals with financial institutions. We go much deeper with the startups we invest in because we want our portfolio companies to win in the marketplace. To us, SaaS is not “software as a service” but rather “sales as a service”. We help our portfolio companies create and execute winning business and product strategies, and drive sales and marketing campaigns with integrated CRM, lead generation, branding, pricing, positioning, competitive analysis, direct sales, channel sales, marketing and business development. And of course, we invest cash, provide co-working space and provide access to our growing network of leading financial institutions, entrepreneurs, strategic channel partners, VCs and angel investors. We go deeper into the “stack” and role up our sleeves with our portfolio companies by investing significant resources in sales and marketing activities to accelerate direct sales of new disruptive FinTech products to financial institutions and through channel partners. We provide the #1 thing every FinTech entrepreneur needs to grow their business, help raise capital and substantially increase shareholder value – accelerate your SALES results and expand your customer base. the S&P and Nasdaq are in correction -- A near-9 percent dive in China shares sent world stocks and commodity prices tumbling on Monday, and U.S. stocks ended a volatile day with the S&P 500 and Nasdaq composite indexes sliding into correction territory. After dropping more than 1,000 points, or almost 7 percent, at Wall Street's open, the Dow Jones industrial average cut its losses but still finished down 3.6 percent. The Standard & Poor's 500 index closed down 3.9 percent for the day and was 11 percent lower than its May record high. The benchmark S&P index has accumulated 9.95 percent of losses in just five sessions. 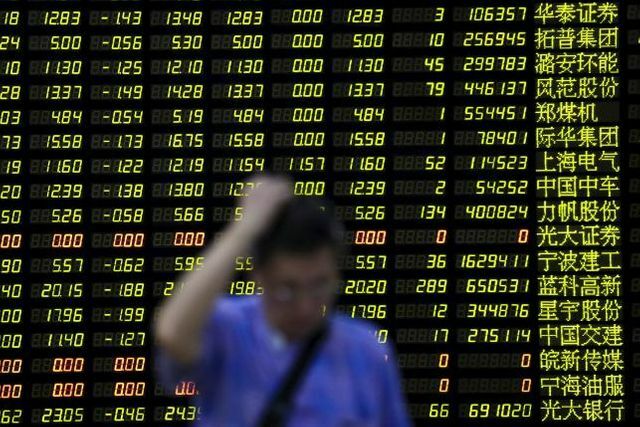 A near-9 percent dive in China shares sent world stocks and commodity prices tumbling on Monday, and U.S. stocks ended a volatile day with the S&P 500 and Nasdaq composite indexes sliding into correction territory.